“Peace, Beaver,” said Aslan, with a very low growl. “Come and take it then,” said the Bull with the man’s head in a great bellowing voice. In Narnia, the Deep Magic is a law of justice much like the old covenant law in the Bible. Just as the Biblical law was written on stone tablets, the Deep Magic was engraved on a Stone Table. Although both serve a just purpose, both are ultimately ministries of death (2 Cor 3:7). Knowing this, the Witch attempts to use the Deep Magic for her own nefarious purposes. Like Satan in our world, the White Witch is a legalist who uses the Law to accuse and condemn men. She is a religious spirit whose desire is to control and rob people of freedom and joy. She entraps Narnians in stone and has the whole country under her wintry curse. The result of Adam’s sin and Edmund’s, was a death sentence for the entire world. And in both cases, propitiation, or satisfaction, demanded blood. “Oh, you’re real, you’re real! Oh Aslan!” cried Lucy, and both girls flung themselves upon him and covered him with kisses. Our lives were forfeit, but God loved us so much that He sent us His Son to be the propitiation for our sins (1 Jn 4:10). If the Deep Magic of Narnia represents the old covenant law which condemns, then the Deeper Magic represents the grace and goodness of God which redeems and sets men free. As you can probably guess, the Deeper Magic is better than the Deep Magic! Grace trumps law. Just as Aslan’s sacrifice undid the Witch’s diabolical scheme, Jesus’ death and resurrection destroyed the devil’s work. This was not a contest of equals. 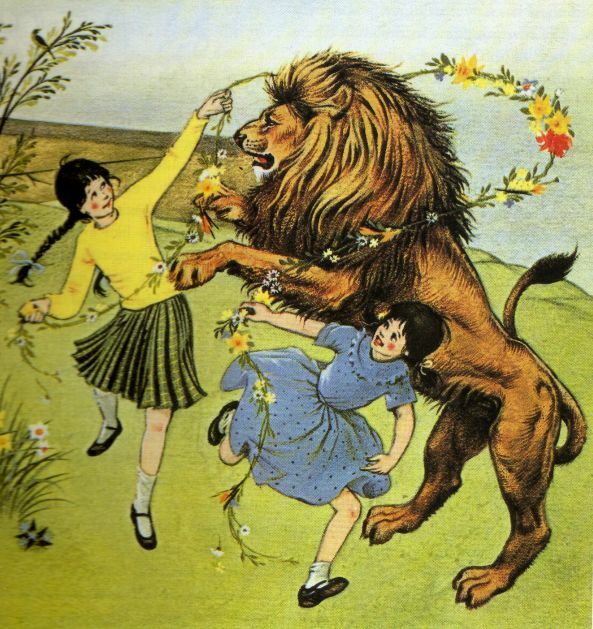 Aslan was never in any danger of losing to the Witch. In what she thought was her moment of triumph, he was actually disarming and defeating her. The Stone Table – that vile place of execution – became a place of deliverance for the whole land. Future Narnians would come to revere the site as hallowed ground. On the cross of Calvary, Jesus became the propitiation for the sins of the world (1 Jn 2:2). On the cross, the righteous demands of the law that stood against us were fully satisfied. If those demands had not been fully satisfied, Jesus would not have been raised from the dead. When we see the risen Jesus we can rejoice knowing that our debt has been fully paid. His resurrection testifies to our justification. For the Christian who apprehends this truth, every day is Easter Sunday. The chronicles of narnia was the first movie i favourited the most when i was still in elementary school, not knowing that it actually has the typhology of the scripture. When i found that out, i was extremely thrilled. its just amazing how God leads me to like the things thats not from this world..
Hi Yemima, I encourage you to read the books – they’re even better than the movies! I love the gospel of Narnia. Some people put it down and try to criticise it like scripture but its literature with a theological thread, entertaining and highly instructive when read through a spiritual lens. It definitely helped me on my way to fully understanding God’s grace. I never tire of the Last Battle. What a tale. Who could imagine it! What a wonderful imagination CS Lewis brought to the pages of his books. My dad found a used set of the Chronicles of Narnia several years ago at our local used book store and gave them to me as a gift. To this day, they sit in a spot next to my reading chair and I reference them often. I don’t agree with all of the theological twists and turns but that isn’t the point. The word pictures he created through his literature are simply amazing. Deeper magic and deeper justice. The justice measured out through the law written on stone brings condemnation and death. If only we would live and define our life from within this deeper justice instead defining ourselves through covenants within covenants, laws within laws which keep us as slaves. C.S Lewis sowed the seed to understand this relationship, religion confused the relationship through performance doctrine, control mechanisms, and inner group loyalty disguised as Unity. Andrew Wommack watered the seed. . . my righteousness through faith in Jesus’ righteousness. Love it! Thank you for affirming Christ’s penal substitutionary atonement.